Maybe it’s the first signs of spring that I’ve seen popping up lately, but I’ve been craving fresh, flavorful veggies like you have no idea. And it’s mostly the green, leafy vegetables like kale, spinach, chard, and broccoli. I love preparing vegetable side dishes with most of my dinners, but if I’m pressed for time, I need one that doesn’t take a lot of time or effort. Enter my Easy Asian-Style Broccolini Recipe. This healthy side dish recipe takes no longer than 10 minutes, which I love, but it’s also packed with nutrition and tons of flavor. 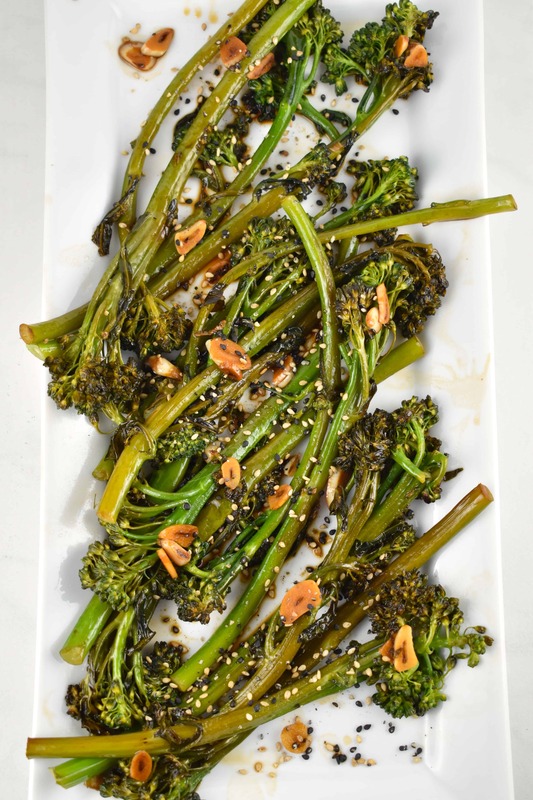 The mild sweetness of the broccolini stands up very well against the salty, boldly flavored seasoning. 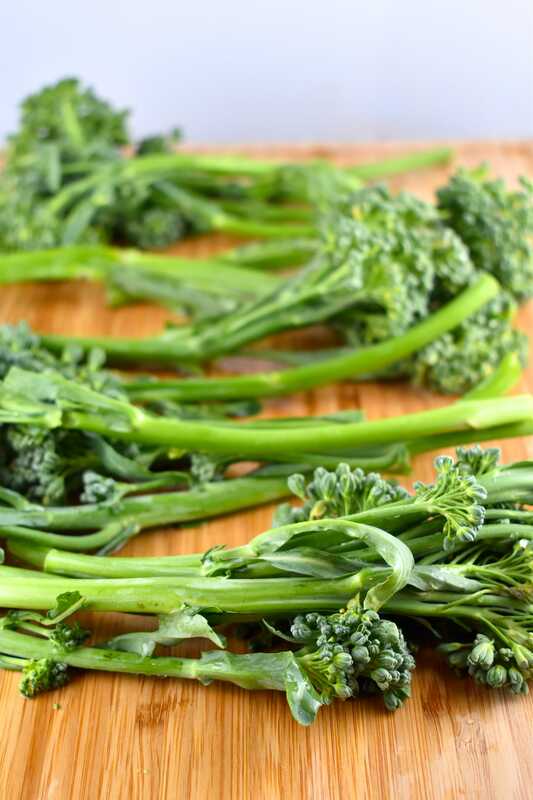 While it may often be called baby broccoli, broccolini is not a younger version of traditional broccoli. It’s actually a vegetable that is a hybrid of broccoli and kale, with little florets and leaves on thin, lanky stalks. And you can eat every part of it. I often prefer the long, lanky stalks and slightly sweeter flavor of broccolini to the short, thick, clumpy florets of regular broccoli. And the leaves have a mild, bitter flavor which I love. It cooks really fast, too, and is very versatile! It also makes a great substitute for (and is cheaper than!) asparagus in just about any recipe. 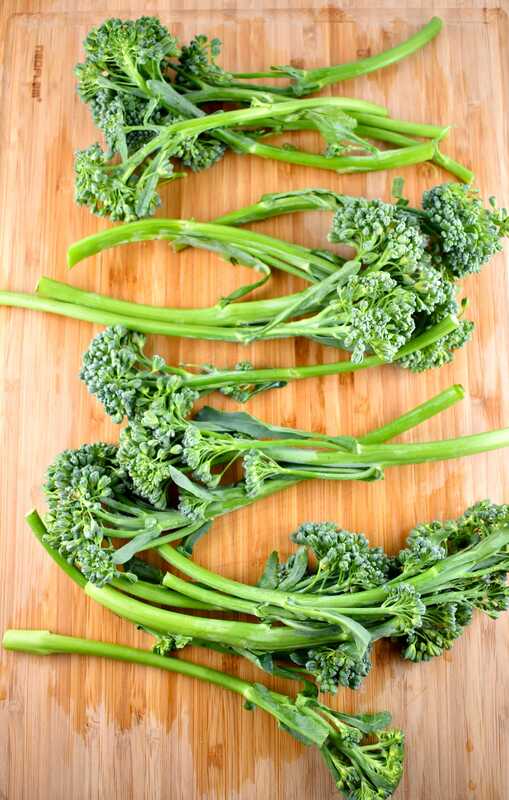 You can cook broccolini typically the same way you’d cook broccoli. Though broccolini does cook a bit faster, as it’s more slender and delicate. Sautéeing seems to be the most popular method, but roasting or steaming works too. In fact one of my favorite broccolini recipes is my Roasted Broccolini and Ricotta. I make this dish ALL the time. What I did in this recipe is simply sauté the broccolini with the garlic slices in a bit of avocado oil (or any high heat oil that you prefer). I drizzled it with some salty soy sauce, tangy rice vinegar, and earthy toasted sesame oil. Soooooooo tasty! 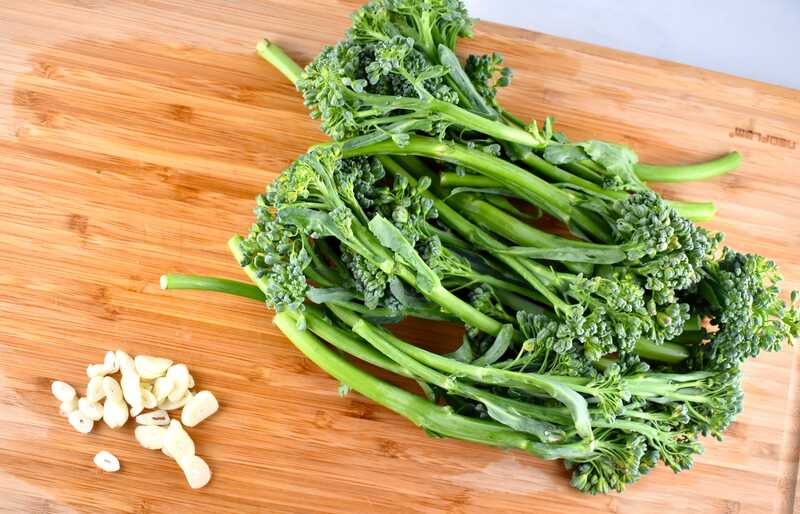 The nutritional profile of broccolini is pretty amazing too. It’s comparable to regular broccoli in that they are both deliver a healthy dose of Vitamins A, C, and K. It also has a nice punch of potassium and calcium. It’s healthy, cooks quickly, tastes amazing, and can be cooked in just 10 minutes. What’s not love? Even both of my kids will devour this with no complaints! And we all mostly prefer it to regular broccoli. It pairs wonderfully with just about any meat dish, fromm beef dishes to chicken, lamb or pork. If you want to make it as more of an entree rather than a side dish recipe, just toss in some tofu, scrambled egg, sliced chicken breast, or noodles (if you want to spend the extra Points), and double the sauce. This way you’ll get a complete, filling dish. If you’ve made a New Year’s resolution to eat more greens, this Easy Asian-Style Broccolini Recipe is about to make that commitment a whole lot easier! 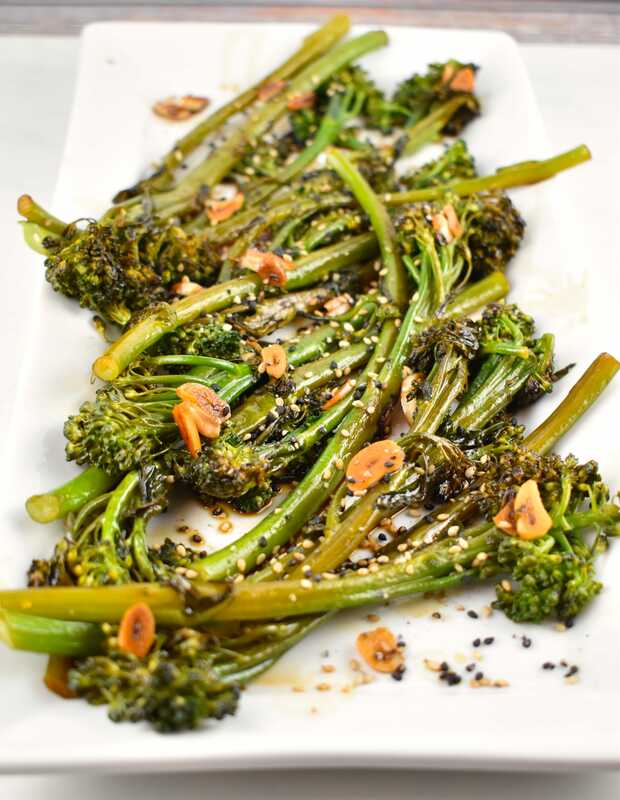 Give your broccolini a serious flavor boost with this fast and easy side dish recipe. 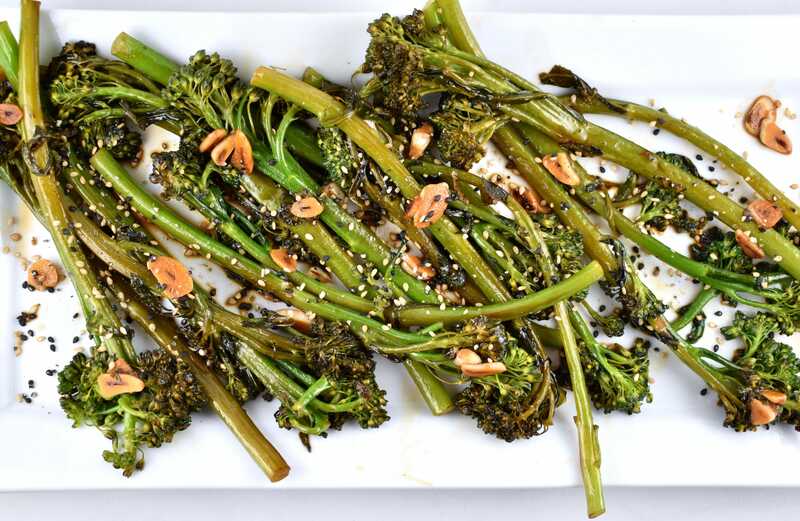 Delicious, sauteed broccolini, tossed with a savory and tangy Asian-style sauce. Heat avocado oil in a medium sized skillet over medium high heat. Add in broccolini, garlic, and 1 tbsp of water. Saute for about 2-3 minutes, or until crisp tender. Stir in the soy sauce, toasted sesame oil, and rice vinegar. Saute for another minute, then transfer to serving plate.